Your wardrobe deserves a fresh new look! An in-depth style and wardrobe check is an optimally start. The focus is on you, your concern and matters of style and your current wardrobe situation. As Fashion Stylist, I organize your wardrobe, I evaluate and analyze the use of garments and what you lack. Advising you what to renovate, to keep or remove to take full advantage. I will go through your wardrobe, and together we sort out what doesn’t suit you and define a fitting silhouette, cuts and accessories for you. In the end, you’ll keep a fixed shopping list for new additions, which cleverly complement your look or modify your style. Since color is very important of an overall harmonious image, it is recommended to have a professional color consulting. 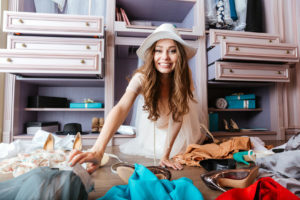 The style and wardrobe check ensures to know you better and builds a perfect foundation for personal shopping assistance. A further appointment to put together well-coordinated outfits is also a sensible addition. The optional color consulting takes 1 hour and will open up a world of your personal colors to you. Or like a combination „My total wardrobe refresh“: from € 289 for 3 h wardrobe check, 1 h color consulting und 3 h shopping-tour. * Expenditure of time varies with the size of the wardrobe.